My children like learning history through age appropriate video documentaries and audio books. The more exciting and adventurous it is, the better. Honestly, who would want to sit and listen to a poorly narrated monotone voice-over for an extended amount of time? Certainly, not me. I’ve found that with well done curriculum, once I bring something up from their lessons of past they tend to recall important information far better. I can’t stress enough on how it’s so important to offer children engaging ways to study that appeal to their interests and learning styles. Learning should pique curiosity and the imagination. We as parents have the opportunity to nurture that with the right tools & resources! As part of the Schoolhouse Crew Review team, I jumped at the opportunity to share my thoughts upon Heirloom Audio Productions latest audio theatrical drama adapted from a book, by G.A. Henty. This particular tale with a Christian perspective presents the history of William Wallace and King Robert The Bruce in an exciting way. I received the In Freedom’s Cause Single Package which includes a physical 2 CD set, a digital download study guide, MP3 soundtrack, and a digital copy of The Prayer of William Wallace. The package has everything one would need to complete a great study and is very reasonably priced at just $29.97 plus shipping and handling. What was Received- The physical cd set arrived packaged well and included information on how to download all extras that comes with the package. The CD copy features a very nice tri-fold case with a disc on each side and The Prayer of William Wallace (from the sacred song for King David, Psalm 23) at the center. There’s a insert seated in the middle that has information about Heirloom Audio Productions and also short bios on each of those that lent their voice to this project. Many of the cast members are well known and include stars such as Joanne Froggatt from Downton Abbey, Skander Keynes from Chronicles of Narnia, Billy Boyd of Lord of the Rings and more. Downloading – The additional digital goodies were easy to locate on the website. The time it spent to download was a little longer than expected because the files are large. But once completed, each file loaded quickly without any issues once saved to my Windows computer. To load these you’ll need to make sure you have a program that can open PDF files as well as well as play media in MP3 format. The files can be loaded on a computer as well as a tablet! Study Guide – The complete In Freedom’s Cause eStudy Guide and Discussion Starter is must if you plan on using this for schooling or Bible study! The Bible studies can be found at the end of this guide. These studies focus on the Biblical themes tied into the story about about Fear, Forgiveness, and Freedom. The guide as a whole is rather easy to use as it’s split up into three sections for specific breaking points found in the audio drama. The first section is Listening Well which features questions pertaining to the happenings of the story. We want to make sure children are comprehending what’s going on before moving ahead. The second section is Thinking Further which challenges one to come up with their own thoughts about what is going on. This section also encourages students to further their studies with research and projects pertaining to the story. Defining Words is the last section which list words used in the drama to grow ones vocabulary! The Soundtrack – The score by Emmy-winning composer John Campbell, I adore. It is very fitting to the time and era in which the story takes place. It reminds me of the Braveheart soundtrack that I had playing in the background during my wedding reception. Perhaps, my strong liking of it is due to my Celtic lineage. The soundtrack features 29 songs with a playtime of an hour and sixteen minutes. In Listening – The total listening time of this adventure is two hours and a half. It’s quite fast paced and the adventure is non-stop from start to finish. Age recommendations are for children six years old and up though the drama is well suited for the whole family. I would stand to caution that there are some intense moments and possibly scary situations. This is indeed a story of battle but of triumph as well. I for one am glad they kept things real but I would recommend that discretion be taken. Also it would be good to prepare oneself for difficult conversations if needed. In the beginning of this drama we meet a fictional character who’s path so happens to intertwine with the lead historical characters of the story. Through this character’s journey from a teen to adulthood, we are given the opportunity to learn about William Wallace and King Robert The Bruce personalities and how many of their choices shaped the history of Scotland as we know it. The story is full of adventure, heroics, friendship, faith, loyalty, love, and even a little humor pertaining to a goat woo and things one does when in love! The audio drama is done exceptionally well. The acting, the score, and all the added sound effects are top notch. I feel there was strong conviction and true dedication in the making of In Freedom’s Cause. Once play began it was hard to not want to listen to it from beginning to end in entirety in one sitting. No question, it’s been an excellent addition to our homeschool history studies. What I’ve enjoyed the most is that this story covers the true history, not Hollywood depiction of Braveheart which most have come to know about these historical characters. Sure the film depicts a great hero but in fact his greatness far supersedes the character in the film! For instance, I had no idea he was a such man of faith. Through In Freedom’s Cause, I learned he always carried a Psalter which is a volume containing the Book of Psalms. He had strong convictions toward prayer and seeking God’s will. This frankly is the William Wallace as well King Robert the Bruce that I’d like my children to learn about. The memory of such great men and true heroes that have shaped our history should never be forgotten! I would recommend In Freedom’s Cause. There’s nothing I don’t like about it! I feel it’s a wonderful way to learn about Scottish History and great heroes of old. Perhaps this amazing offering will prompt heroes for our own day. Children need great stories such as this to be inspired by! Interested in Purchasing? 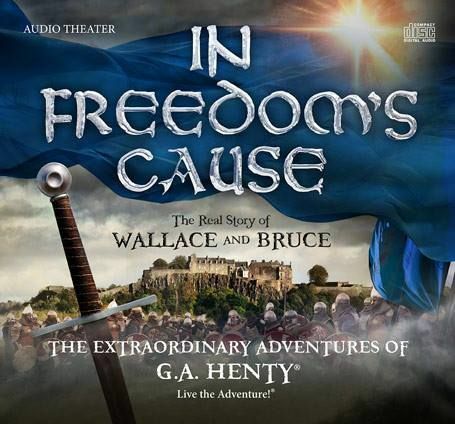 In Freedom’s Cause Single Package which includes: a physical 2 CD set, a digital download study guide, MP3 soundtrack, and a digital copy of The Prayer of William Wallace is $29.97 plus shipping and handling. There are other packages available so I would encourage you to check them out to find what best suits your needs! We loved this and can’t wait for the next dramas! These are so worth collecting.